In Japanese homes, including the most humble, bonsai are given a place of honor in the main room. As readers will know, the furniture and furnishings of a Japanese house are kept very simple, but owners always try to have a miniature tree indoors throughout the year. To do this they have a collection of trees, coniferous and deciduous, from which to choose. The plants grown are hardy and thrive best if they can be ‘rested’ in the open for quite long periods of time. This ‘rest’ is good for their health and helps to widen the interest for the grower, as he does not have the same plant or plants in the house all the time, which is the case with too many house plants. When the bonsai are put in the open, the containers may be plunged to their tops in sand or soil, or arranged on a table, terrace or veranda. The plunging method helps to prevent the soil from drying out quite so quickly in hot weather, and hence cuts down the amount of watering necessary. In winter, however, it would be unwise to decide to put a bonsai out in the open in frosty spells, since the sudden change of temperature, from warmth to cold, could cause the leaves to wilt or fall; the containers also are likely to be damaged by the action of frost. If available a cold greenhouse would be an excellent place for ‘resting’ plants in winter. 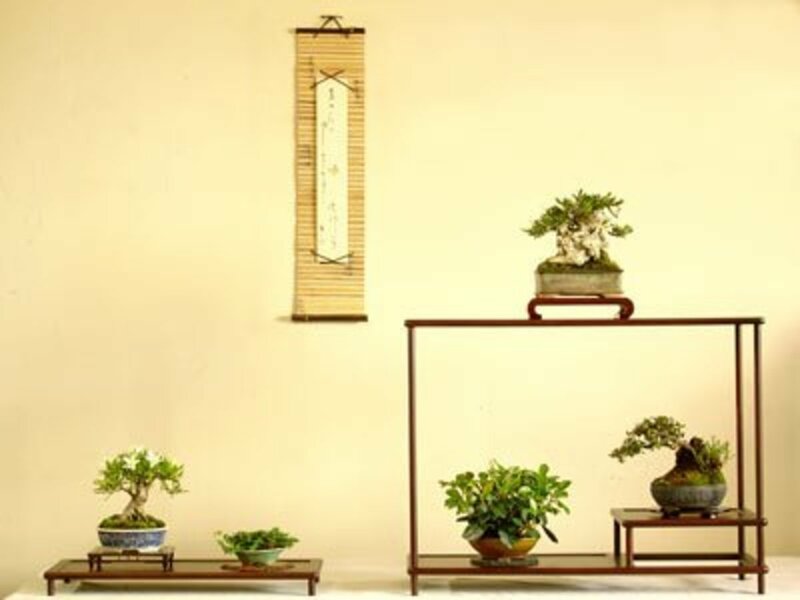 Generally, bonsai could well take the place of pot plants and in general have the same requirements; for example, they need good light and careful watering and feeding. With regard to temperature they are not so exacting — they are hardy and will stand frost provided that they are not suddenly subjected to it after having been in a moderately heated living room. These hardy plants do not, in fact, like high temperatures and they should be kept away from hot radiators. In these days when more and more central heating is being fitted, it is the hot radiators that are more likely than anything else to cause damage to bonsai in the winter. Good light is one of the main essentials for healthy and even growth, as plants always grow towards the source of light. But it should be remembered that in very hot weather serious scorching can occur through the glass; so at such times bonsai should not be left in the window — they will need to be moved to a shadier part of the room or, better still, placed out of doors where they will not scorch. Apart from the fact that light is the best in the window, a window sill does not make a good display place as there is not usually a good background against which the beauty of shape and color can be seen to their best advantage. A plain black background is ideal and it color should be governed by the individual bonsai; evergreens will show up best against a pale color, but the question of color will naturally be a matter of personal opinion; green would ofcourse not be a good choice. If the bonsai is to be appreciated at night, it should be placed, if possible, near a suitable light. A bonsai enthusiast might even go far to have a corner specially wired for hidden lighting. It would not be wise, however, to create a very ‘Japanese’ corner, as this could possibly stand out againstrather than blend with the room and its other furnishings. Since we are thinking of bonsai in European countries, we will not concern ourselves too much with how the Japanese display theirs. In order to appreciate full beauty and interest of bonsai, one should show bonsai individually and not crowded by other pot plants and flowers. 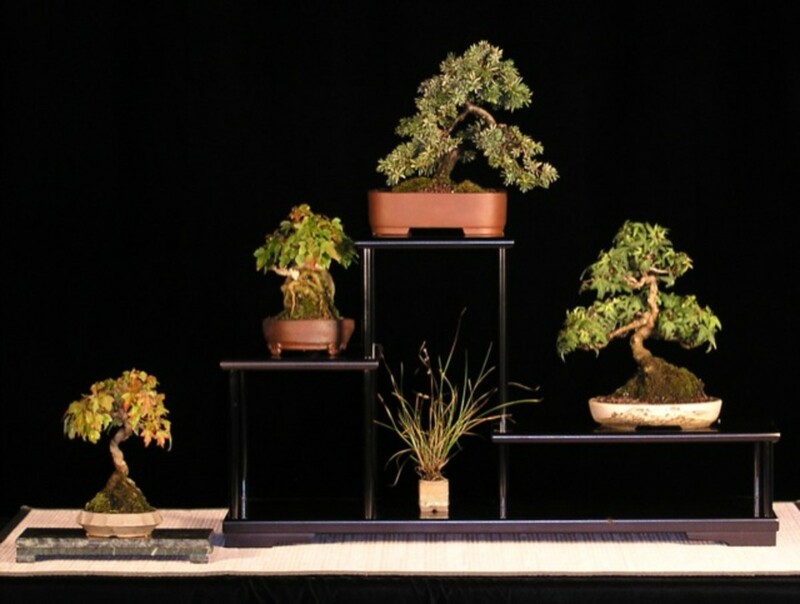 In Japan they are displayed on simple but attractive stands, the legs of which vary in height from one inch or so to several feet, an depending on the size and style of the tree, they are placed low down or high up; the beauty of some bonsai, particularly those in the cascading style, is often best seen by looking up at them. If ordinary bonsai are considered too large, we can grow mame or miniature bonsai, which may be only a few inches high. A very wide range of these can be displayed on specially constructed stand. The species and varieties grown for bonsai are selected for interest they offer in one or more of the following: shape, leaf color, flower and fruit. The list that follows includes some of the easiest species to grow as is intended to give you some ideas upon which to build in your bonsai collection. Acer – for leaf shape and natural shape of the tree.